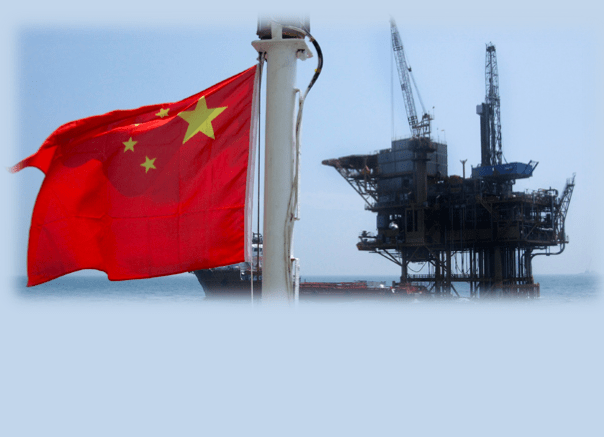 West Texas Intermediate crude oil broke below the $30 psychological support for the first time since winter 2003 due to oversupply in the market and worries about the true state of China’s economy. China imports and consumes a substantial amount of commodities and the reason behind the recent Yuan devaluation was to maintain the competitiveness of domestic firms. Therefore, markets are pricing in lower demand for oil. However, new data out of China may ease these concerns and see oil trade higher on positive data. For example, oil rose in the first time for eight days yesterday on positive Chinese data. Exports only declined 1.4% versus the forecast of -8.0% and the trade balance was much better than anticipated, coming in at $60.9 billion versus the estimate of $53 billion. The next event that could shift sentiment is China’s Gross Domestic Product (GDP), an indicator of economic activity. This is due on Tuesday 19th January (02:00 GMT) and the consensus forecast is 6.9% for the annual growth rate in GDP. A higher than expected figure should be bullish for oil as it will signal higher demand from China whereas a lower than expected figure will be bearish for oil. Geopolitical concerns also weigh on oil, where tensions between Saudi Arabia and Iran are rising. Furthermore, OPEC announced in December it would not cut production to push prices higher. The strategy of squeezing out shale gas producers in the US seems to be working with the number of operating rigs down from 2,031 in 2008 to 664 in the week ending January 8th 2016. The oil price drop has also hurt those in the oil sector as well, with job losses and cutbacks in capital expenditure for many oil-related companies. For example, BP axed thousands of jobs recently and Petrobras has slashed its capital expenditure by as much as 25%. 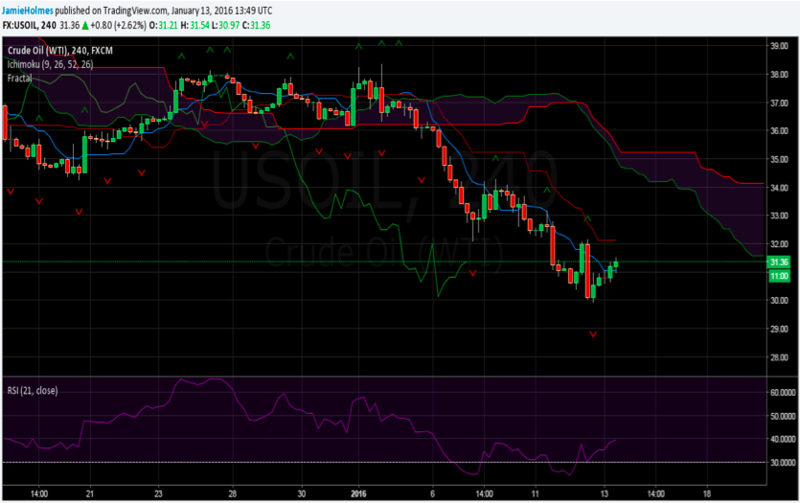 If the bearish momentum in oil markets continues, then stocks prices of oil companies will also be adversely affected. The United Arab Emirates oil minister believes that the first half of 2016 will be dominated by sellers and the oil price will be low but in the second half of the year he expects a pick-up and a better chance for traders to enter long positions. He reckons another 12-19 months is needed to flush out remaining shale gas producers. Morgan Stanley has recently come out saying that they expect $20 oil, mainly due to a stronger US Dollar. Over the longer-term, a key support level lies at $17.30 whereas a key resistance to the upside lies at $33.75 using the lagging line from the Ichimoku indicator. The medium-term technical outlook is displayed in the chart below, showing the 4 hour price action, Ichimoku indicator, fractal levels and relative strength index. The price action has recently closed above the conversion (blue) line, indicating a high likelihood that the price will continue to appreciate. The next resistance is provided by the base (red) line, currently at $32.11 and a close above this level is required to further validate a bullish outlook. On the other hand, if the base line holds as resistance then a bearish trend is expected to develop. The next resistance after the base line will be provided by the Ichimoku cloud, or ‘Kumo’, currently around $34.20 to $35.20. The Ichimoku cloud has stopped trending downwards suggesting that the price of oil may range for a while before the market decides on the next direction. The relative strength index is trending upwards but still below 50, meaning bears have the upper hand. Seller should wait for a close back below the conversion line, currently providing minor support at $31.05. Furthermore, a push below the most recent buy fractal at $29.92 will see bearish momentum intensify and see sellers target $17.30.